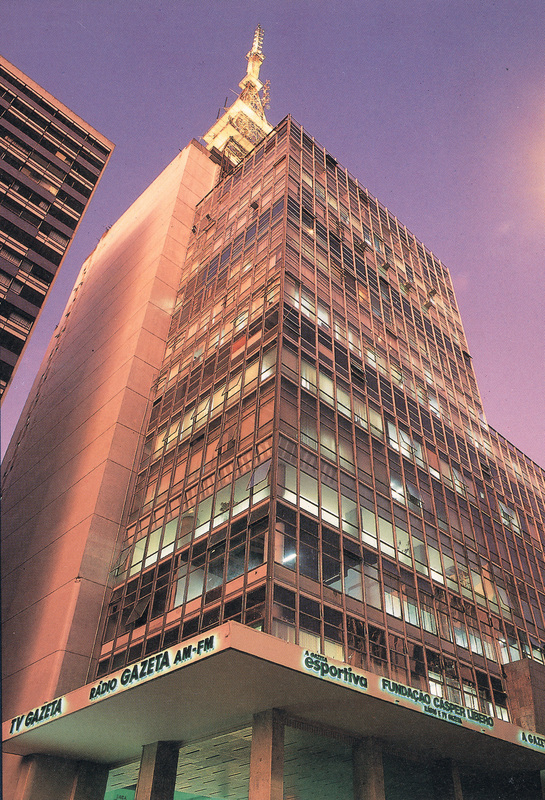 The Gazeta Building is the largest real estate of the Fundação Cásper Líbero. 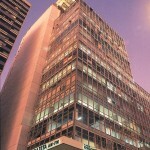 Located at 900 Avenida Paulista, the building has 14 floors, with 68.000 square meters, which house all the units of the Foundation´s business. In the building, an approximate number of 20 thousand people circulate every day. In its base there are two symbols: the frontal panel engraved in concrete with the word “Gazeta”, and the famous staircase with 32 steps. 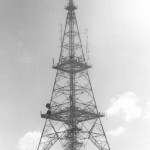 On the top, there are two outstanding symbols of the entity: the TV Gazeta tower and the Rádio Gazeta FM, with 85 meters, and the alarm siren – symbol of the newspaper “A Gazeta” and the memory of Cásper Líbero, which is heard daily by everyone, sharply at twelve noon, in the heart of the Avenida Paulista. 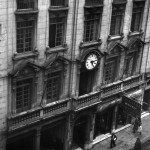 The Gazeta Building is the fifth headquarters of the group since the creation of “A Gazeta” in 1906. Get to know a little more about the former headquarters (two of them do not exist anymore). 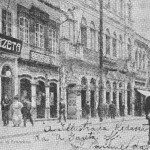 Besides inaugurating the estate “A Gazeta”, on March 16th, 1906, Adolfo Araújo owned the literary newspaper “A Vida de Hoje” ( “The Life Nowadays”) which was, at the time, on the number 9 of Rua Direita. After his death on December 7th, 1915, her widow Dona Branca asks for help from the brother-in-law and brother of the founder of “A Gazeta”, the doctor José Pedro de Araújo. He manages temporarily the publication and the estate, until he finally sells the real estate of Adolfo Araújo to the lawyer Dr. João Dente, in 1915, which after many attempts, he realizes after two years that he has no vocational ability to journalism. So, Dente sells the newspaper to another lawyer, Antônio Augusto Covello. In his turn, Dr Covello stays in the estate between 1916 and 1917, transferring to the Rua Líbero Badaró, in the Maurice Levy Building. 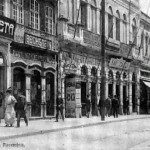 Dr Covello is in charge of “A Gazeta” until 1918, when he sells the journalistic company to Cásper Líbero. 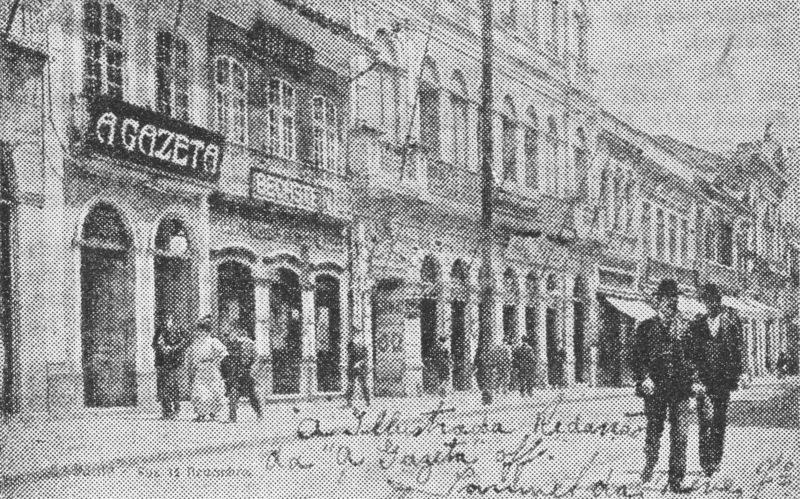 At this time the right printing paper for the newspaper “A Gazeta” was provided to Adolfo Araújo by the Vandoren House located on the Rua do Rosário (currently named Rua João Brícola). 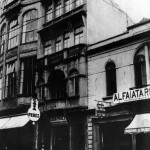 Antônio Augusto Covello transferred “A Gazeta”, in 1917, from the Rua XV de Novembro to the Rua Líbero Badaró, negotiating the rent of the estate with the Commodore Maurice Levy, whose name is the same of the three-store building (ground, first and second floors). Cásper Líbero started working in the office of the newspaper that Dr Covello, also a lawyer, decided to sell. 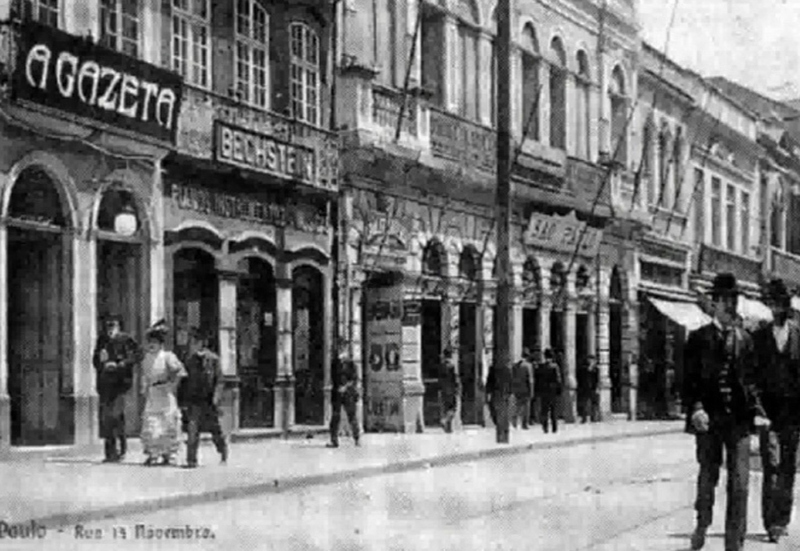 At first, it is offered to Miguel Arco e Flexa who does not accept and recommends the name of the journalist Cásper Líbero, who in turn accepts the proposal of buying the publication and becomes the owner of “A Gazeta” in 1918. 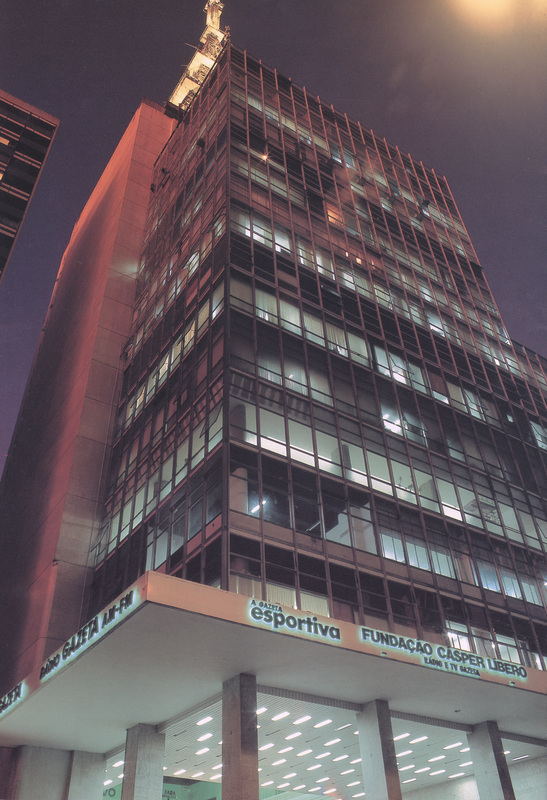 In less than five years, Cásper Líbero negotiated with Maurice Levy for the enhancement of the building, one floor up, as it is currently. It was built in the record time of one week. The inauguration was watched, after a week from the start of the building, by Cásper Líbero, Miguel Arco e Flexa, and Couto de Magalhães. Currently on the first floor, there is the restaurant “Recanto da Líbero”, with its entrance through the staircase at the number 624 and also from the parking lot at the number 628. Currently: Rua Líbero Badaró, 651 (after some modernization after-build-up, it has two entrances: 645 and 651), having nowadays at the address the commercial building on the landsite between the numbers 633 and 641. 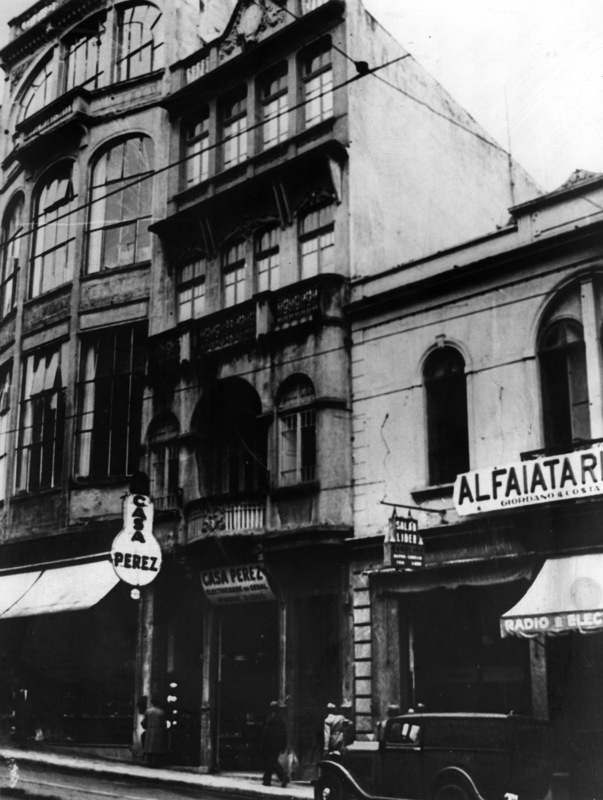 Before being the headquarters of “A Gazeta” in this two-store building with three floors above the street level and three pavements underground, it was a hotel and belonged to Commodore Medici with whom Cásper Líbero negotiated the possibility of the newspaper moving there. 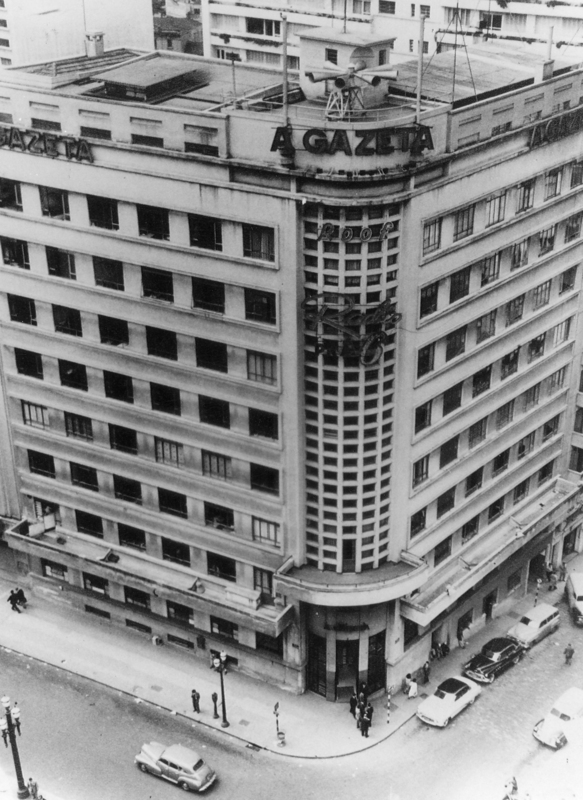 Between 1930 and 1934, after the re-modelling of the office of “A Gazeta” on October 24th, 1930, the newspaper was temporarily at the headquarters of Correio Paulistano (from that 24th of October until November 17th, 1930, the headquarters were at the “Edifício João Brícola” on the corner of João Brícola with the Rua XV de Novembro in front of the Antonio Prado square). 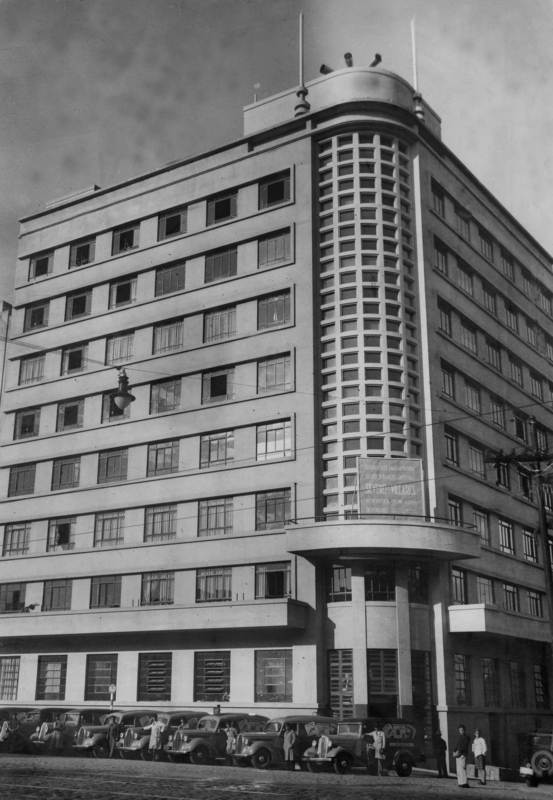 Because of the re-modelling of the newspaper´s headquarters, Cásper Líbero received from the Federal Government an indemnity in 1934 which permitted the building of the Press Palace, inaugurated in 1939. The Medici Building was demolished and currently it is the commercial building of Atento, a respected call-center company, at the Badaró Building (numbers 633 and 641). 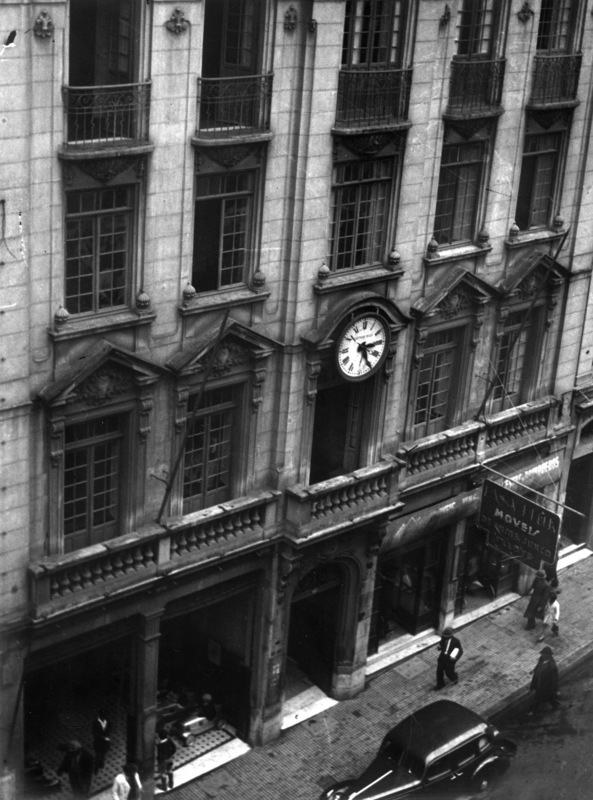 Before that, it was built to become the headquarters for the Bank of Boston (with 19.07 square meters of built area) that worked for several years in the place. Project (Auditorium): Martins Fontes and Eurico Jose. On November 3rd, 1939 a solemn inauguration happened with the blessings of the São Paulo city Archbishop Dom José Gaspar de Affonseca e Silva. The speeches at this date were given by José Maria Lisboa (director of the Diário Popular and president of API – The Paulista Press Association), João Neves da Fontoura (journalist, councilman and member of the ABL – Brazilian Academy of Literature) and Cásper Líbero himself. Brief words were also spoken by personalities of the time: Assis Chateaubriand, Stefan Zweig, Henri Torrés, Tristão de Ataide, Viana Mog, José Mariano Filho, João Neves de Fontoura (already mentioned), Olegário Mariano, Maurício de Medeiros, Altino Arantes, Figueiras Lima, Colonel Onofre Muniz Gomes de Lima, Luiz Edmundo, Lopes Cansado, Colonel Ayrton Lobo, Colonel Jonas Correia, J. Maciel Filho, Alcântara Machado, Priest Arias Cruz, Manoel Oliveira Franco Sobrinho, Costa rego, Afonso Arinos de Melo Franco and others: writers, critics, novelists, theologians, economists, historians, military men, consulting judges, artists, etc. A concert by Madalena Tagliaferro is also performed, playing Beethoven and Chopin, who also makes a Course of Piano Interpretation, as well as the Regent Heitor Villa-Lobos, who also made a speech, and a course about Experimental Psychology by the Dominican Priest Marcel Marie Desmarais. 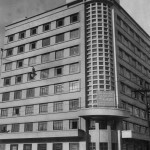 The Press palace was the first building projected and built specially for a communication vehicle in the country. Since the end of the decade of 1960, the estate no longer belonged to the Fundação Cásper Líbero, being its first headquarters since 1944, when the estate of “A Gazeta” and Cásper Líbero were transformed in Foundation from what was described by the journalist in his will (Cásper Líbero died in 1943). The estate was acquired in 007 by the Military Justice of the Union, in São Paulo, undergoing a great work that restored the façade and some other parts besides modelling the activities of the institution. The work was done between December 2008 and May 010, being the building re-inaugurated with a great event on the 17th of June, 010. The circular painting by the Italian artist Fulvio Pennachi, measuring about 8 meters in length, was preserved and restored. The fresco, from 1969, tells the story of the press (starting with Johannes Guttenberg, the father of the world press, in 144, in Mainz, Germany) and is located at the top of the small entrance hall (where it is the front desk and the building´s elevators). Pennachi made the fresco by request of Cásper Líbero to illustrate even more the importance of the Press Palace. 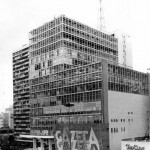 According to Miguel Arco e Flexa, in the book “48 Years of A Gazeta”, the estate was called Edifício Gazeta (as the building on the 900 of Avenida Paulista) and also due to the Press Palace being the first set to be the communications center of the country). 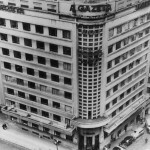 Its nickname was, before and after the owner-journalist´s death, “Cásper Líbero´s House” (nickname which the Gazeta Building on Avenida Paulista also had in the beginning). The Foundation saw the necessity of expanding its whereabouts and centralize the companies in one place only. Something symbolic that could portray the ideals of its founder was thought about. 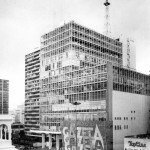 So, the idea of creating the Cásper Líbero House appeared in plain Avenida Paulista, the symbolic address of the city. The idea wasn´t so simple. It was a bold project, the dream of creating a large cultural center, installed in the largest building in the world, would become the largest building made with concrete cement. The work started in 1958. The project was conceived by the renowned engineer José Carlos de Figueiredo Ferraz. 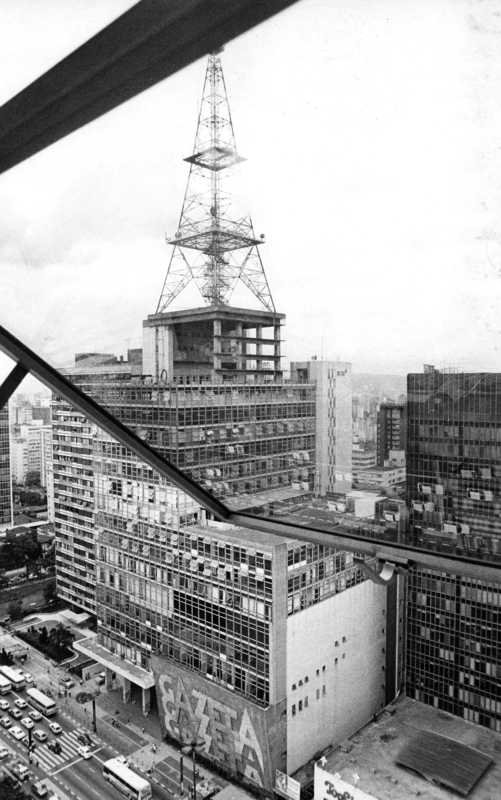 The future São Paulo mayor was a builder of historical sites such as the empty space under the MASP – The Art Museum of Sao Paulo, the São Paulo subway, the Ibirapuera Planetarium, the dome and the towers of the Se Cathedral and the Municipal Square. The engineer Ary de Albuquerque (hired by the Foundation) was responsible for the work. 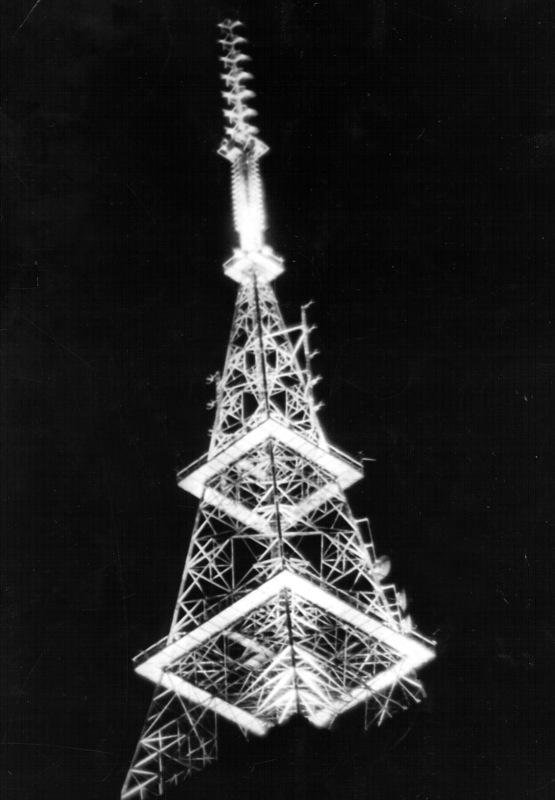 The project had a slogan name: A Light Over São Paulo. Returning to the construction, the chosen place on Avenida Paulista was the central area of the block between Alameda Joaquim Eugênio de Lima and the Alameda Campinas, with its back towards the Rua São Carlos do Pinhal. 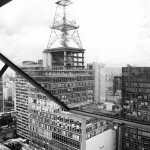 When this special article was published, two thirds of the work were already built (8 meters high over Paulista). 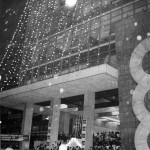 The building gradually started to be used officially in the first semester of 1966 (some departments were already in the building in the beginning of the decade, as the administration, which moved there in 1961). Step by step, everyone moved from the Press Palace to the new “Cásper Líbero House”. 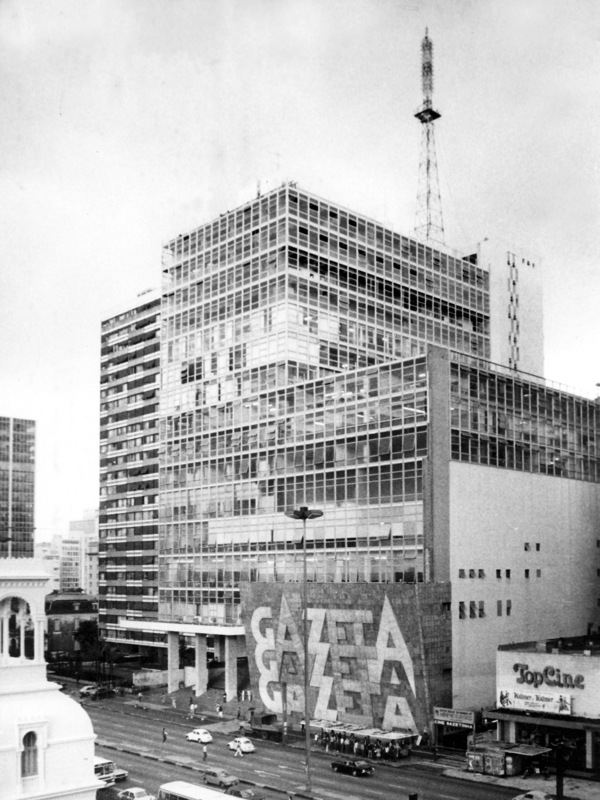 On May 1st, the Cine Gazeta was opened with the film “Yesterday, Today and Tomorrow” (with Sophia Loren and Marcelo Mastroiani); still during May the tower construction of the future TV Gazeta. On June 30th, the legal transference to the new building happened, emptying the former headquarter at the Avenida Cásper Líbero. 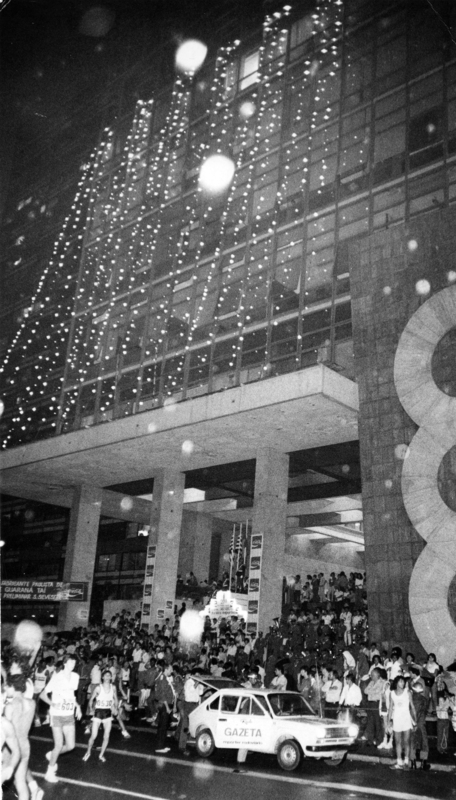 A sign of importance that the work had for the engineering field is that on June 16th, 1966, the Edifício Gazeta was chosen for the opening of the IX Journey of South-American Structural Engineering. During one week, the building was inspected by around 150 technicians from 40 South American countries, besides Brazilian engineers from all states. It was an ambitious project. The façade already impressed those who walked by. 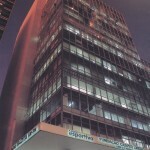 A large staircase was built on the number 900 of Avenida Paulista. 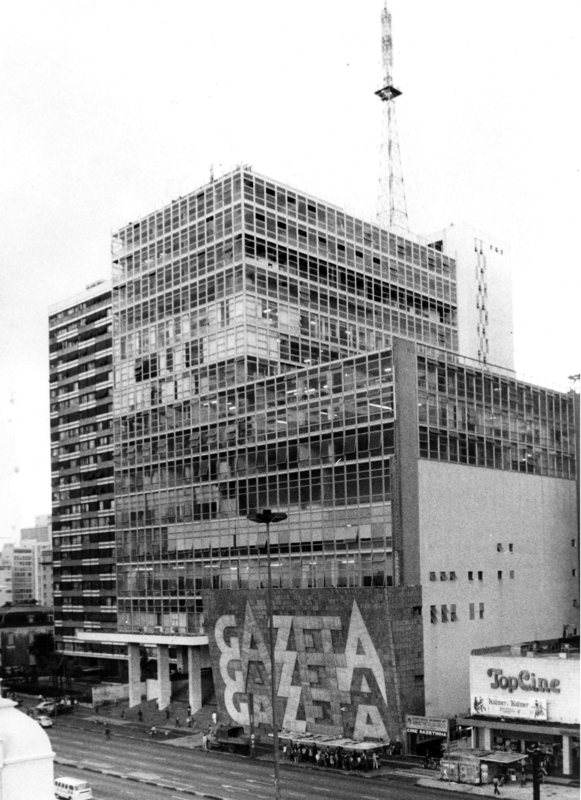 Also a panel of 45 degrees of inclination, with the painting of a huge flag of the State of São Paulo (the panel was replaced by the concrete mosaic, with multiple “Gazeta” logos on December 18th, 1978, which gave Avenida Paulista a new symbol; after reformation started in the first semester of this year, the panel Gazeta was inaugurated with party, in the frontal piece of the Gazeta Building, by the artist Fernando Cerqueira Lemos). For being larger than the sidewalks on Paulista there was a small garden with 30 masts in which hung flags in the black, red and white colors. And still a touch of modernism on the canopy under the staircase: a real iron and concreted cement railing, with a light inclination to the top. The columns of the staircase were round. With the modifications in the project, the modern canopy was replaced by another conventional and rectangular and the pillars became larger, with straight angles. 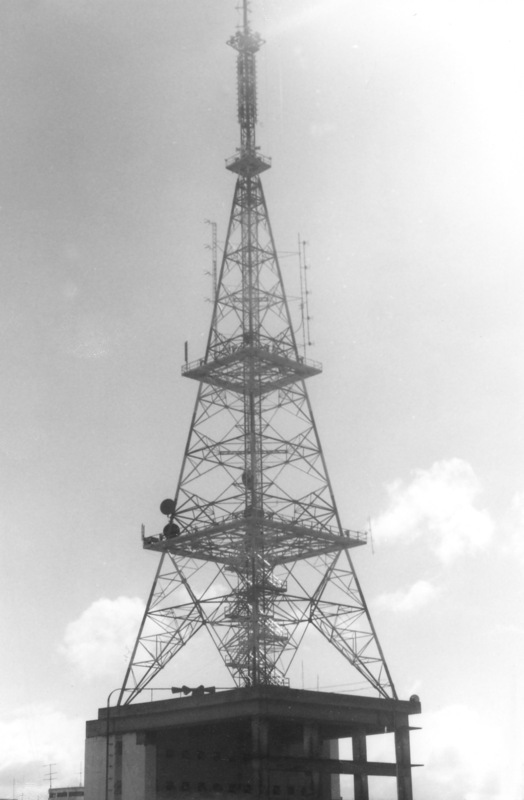 On April 1st, 1983, with a partnership with TV Globo Network, the tower of TV Gazeta was built – with the antenna of both broadcasters. 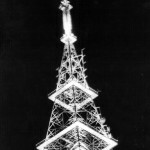 It was the first lit tower of São Paulo and, consequently, the first on Avenida Paulista.